The creep of maritime sector education in South Africa may be decidedly slow, almost imperceptible yet it is an absolute certainty, and it is about to come full circle with the envisaged formal roping into the milieu of the country’s technical vocational education and training (TVET) colleges in a year’s time. With TVETs on board, maritime sector-focused public sector education will have reached virtually all relevant levels of formal education structures in the country, from foundational (currently high schools) through to vocational and tertiary levels. The ‘10th Province’ has it in good authority that TVETs will be drawn into the fray in earnest from January 2017, with the launch of a pilot project involving two TVET institutions in as many provinces; one in KwaZulu-Natal and one other in the heart of Cape Town, Western Cape. According to plans currently, the two colleges will initially offer respectively an NOC qualification in only two of levels of disciplines of seamanship; an “Able Seafarer Deck and Able Seafarer Engine” and an “Able Seafarer Deck & Fishing and Able Seafarer Engine”. Championing South Africa maritime economic sector skills development: Transport Minister Ms Dipuo Peters with the country’s first group of cadets taken on board Vuka Marine’s commercial cargo vessel, the Cape Orchid for a six months sea based training. The pilot phase envisages currently the enrolment of about 30 aspirant seamen (15 at each college), taken through a staggered introductory phase that will see the KwaZulu-Natal based TVET college lead the process by offering the courses from January 2017, and followed by the Western Cape located college in July of the same year. Apparently the reasons for the considerably low intake initially are overshadowed by the country’s chronic shortage of training berths (actual space for experiential training on sea going vessels). A feasibility study conducted recently established that with at least seven TVETs roped into the fray from 2017, the country could produce approximately 560 seamen per annum thenceforth. This would go some way in meeting the maritime sector skills requirements identified by the Operation Phakisa (Ocean Economy) national campaign launched a year ago. However, with a lack of berths which continues to have a decidedly firm stranglehold on the country’s cadet training – even with the existence of a dedicated training vessel, the SA Agulhas currently under the command of the South African Maritime Safety Authority (SAMSA) – it would be an exercise in futility. In addition, as possibly could be expected, the critical shortage of berths for the crucial experiential stage of seamen training, renders this final stage highly costly. Recent financial estimates for development of seamen at the levels as outlined above (National Occupation Certificate) were that it would cost approximately R106 500 per trainee per annum, with as much as R84 000 or 79% of total costs absorbed by experiential training. Put into perspective, with current conditions involving lack of berths, of the estimated R60-million that would be required to produce 560 seamen per annum by TVETs, R47.04-million would go into experiential training. Significantly, the conversion of the SA Agulhas into a dedicated training vessel about three years ago contributed immensely to reduction of awaited berths vacancies experienced particularly by tertiary level institutions focused on maritime education, such as the Durban University of Technology and the Cape Peninsula University of Technology. Quite clearly, with the entry of TVETs into field of maritime sector education and training, far more berths would be needed to sufficiently cater for the planned production of skilled seafarers in the country generally. This notwithstanding, the TVET colleges’ programme geared for introduction in just over a year’s time is said to be structured currently to offer a six months theoretical tuition and practical physical training at college, followed by seaborne accelerated training on board vessels towards an ‘Ordinary Seafarer’ qualification, upgradable to a fully-fledged ‘Able Seafarer’ level qualification through a further 12 months full-time vessel occupation. However, discussions on the final details and associated plans involving a variety of potential partner service providers are ongoing. Key role players include SAMSA, the South African International Maritime Institute (SAIMI), the Department of Higher Education (DHET), the Transport Education and Training Authority (TETA), and several others. Email: epines@samsa.org.za or Office: 031-307 3006. EXPLORING LIGHTHOUSES: Mr Morakabe Seakgwa (red tie), Senior Manager, Projects Co-ordination at the South Africa Maritime Safety Authority (SAMSA) Centre for Maritime Excellence, along with Ms Cloris Ngwenya (seated left at top of the table) SAMSA’s CME Co-ordinator, having a leisurely chat with members of the Cebu Chamber of Commerce at the Pretoria home of the Philippines Ambassador to South Africa on Monday. Deepening South Africa’s efforts towards rejuvenation of its maritime economic sector precisely through expanded education, training and skills development requires as much planning as it does focused engagement with partners, local and international. It was with appreciation of that reality when early evening on Monday, a delegation of the South Africa Maritime Safety Authority (SAMSA) joined a Philippines business delegation at the Pretoria home of the Philippines’ Ambassador to South Africa for a casual yet exploratory chat about possible links that could benefit both countries in the field of maritime. Also in attendance were representatives of the Department of Trade and Industry (DTI) and appropriately, the Department of International Relations and Cooperation (Dirco). Led by its president, Teresa B. Chan, the Cebu Chamber of Commerce delegation had been in the country since November 18, meeting its business chamber counterparts in Cape Town and Johannesburg, before a brief tour of the region ending in Pretoria. SAMSA’s interest in meeting the business group hinged on its knowledge and involvement in maritime economy development issues, specifically opportunities for cooperation in education, training and skills development and about which the Philippines is acknowledged globally. An established fact is that for every four sailors out at sea anywhere in world, chances are that one will be from the Philippines – a testimony to the country’s intense focus on maritime economic sector skills development over the years. According to the New York Times, the combined official annual output of maritime sector skilled people in that country is estimated at more than 20 000 personnel, with several of these eventually serving on vessels and ocean bound trade services across the world. As it were, the Philippines with a Gross Domestic Product (GDP) estimated at US$693.4-billion (or R9.72-trillion) in 2014, from an average annual growth rate of 6.1% in the period; derives a substantial amount of its income from seafarer and related maritime economy tradesmen remittances involving as many as 5-million workers abroad. Meanwhile, South Africa – with direct exposure to three oceans with a coastline equivalent some 3000km, but with no more than 2000 seafarers at sea in 2013, and against the backdrop, having only recently laid out plans to intensify its own output of maritime economy focused human resources under the Operation Phakisa (Ocean Economy) campaign – has set itself modest targets in comparison. In terms of seafarers alone, the Operation Phakisa (Ocean Economy) Marine Transport and Manufacturing (MTM) lab launched a year ago had identified the skills gap as 17 500 to 28 500 seafarers required in the next five years to support implementation of plans to grow South Africa’s participation in ship and oil rig repair and refurbishment, boat-building and other vessel construction, sea and coastal transport, and development of a national registry. This was against the backdrop that South Africa as at 2014, produced an average 240 officers per year – a development in which SAMSA has played no small part. SAMSA is not only involved in promoting and encouraging the spread of maritime economy sector education, training and skills development at all education levels, from high school through to universities and vocational institutions, but is also hands on, as the operator of the country’s only dedicated cadet training vessel, the SA Agulhas. Constantly mindful, and acting within its broad mandate, SAMSA’s operating principle in the promotion and encouragement of the expansion of maritime sector education, training and skills development pivots on the forging of strong and lasting contributory partnerships both in the public and private sectors, locally and internationally. To date, it has been instrumental in forging or enhancing highly beneficial relations in maritime education between South Africa and countries such as Sweden and Vietnam among others, while locally, it continues to work hand in glove with respective government departments on sustaining highly functional relationships with key role players from across sectors in education, training and skills development through to trade. Among highlights of the above endeavors, resulting from engagement with the country’s higher education institutions, but notably; the Nelson Mandela Metropolitan University (NMMU) in Port Elizabeth, as well as industry players and other interested parties, has been the launch a year ago of the South Africa International Maritime Institute (SAIMI) under which significant, focused maritime sector education and research shall be conducted henceforth. BRIDGING GAPS: (Seated right with red tie) Mr David Moisi, Senior Manager in the Office of the CEO at South Africa Maritime Safety Authority (SAMSA) engaged in discussion with representatives of the SA department of Trade and Industry as well as those of Cebu Chamber of Commerce. On the basis of the conversation that took place with the Philippines business delegation as well as government representatives on Monday evening this week, the first prize for SAMSA would be opportunities for South Africa students at tertiary level to obtain entry for maritime sector studies at one or several Philippine tertiary level institutions, as is the case currently with Sweden and Vietnam. Optimally, cooperation and partnership with the Philippines on skills development across the maritime economic sector would be most welcome. Undertakings were made between the parties for continued engagement. 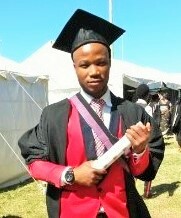 Cyril Zenzele Makukula of KwaZulu Natal ain’t no ordinary young person – at least not if his extremely poor background on the one hand, marked sharply by sheer desperation of a life survived wholly and literally on hand outs, and on the other hand; his current exceptional performance as a maritime studies student at a foreign university in South East Asia; are anything to go by! The contrasts could not be sharper for ordinary expectations, nor his current exceptional class achievements so far, readily predictably given the background. Zenzele’s “sharper than a razor blade” story emerged from Hanoi this week after first year students’ final year-end results released by the Vietnam Maritime University’s International School of Education a week ago, showed that Zenzele emerged as South Africa’s top performing student in his class at the university where he passed with five (5) distinctions out of six modules he was enrolled for in the current year. Zenzele (26), who entered the university a year ago as one of the first batch of South African students now at the institution pursuing maritime sector studies, is enrolled for a Bachelor’s degree in Global Affairs Studies and Maritime Affairs; with modules this current year that consist of English, and Speech Communication as electives; as well as Foreign Language, Globalization and International Relations as majors. A transcript of his exam results shared with the SA Maritime Safety Authority (SAMSA) this week show that Zenzele obtained straight A’s in four of the modules – denoting a subject pass mark of between 85% and 100%, while in two others, he obtained B’s denoting modules pass marks of between 71% and 84%. In terms of ranking, his final score of 3.62 for a year’s mark denoted an “excellent” top performance by a student, according to Vietnam Maritime University ISE’s dean of students, Dr Nguyne Minh in a statement. 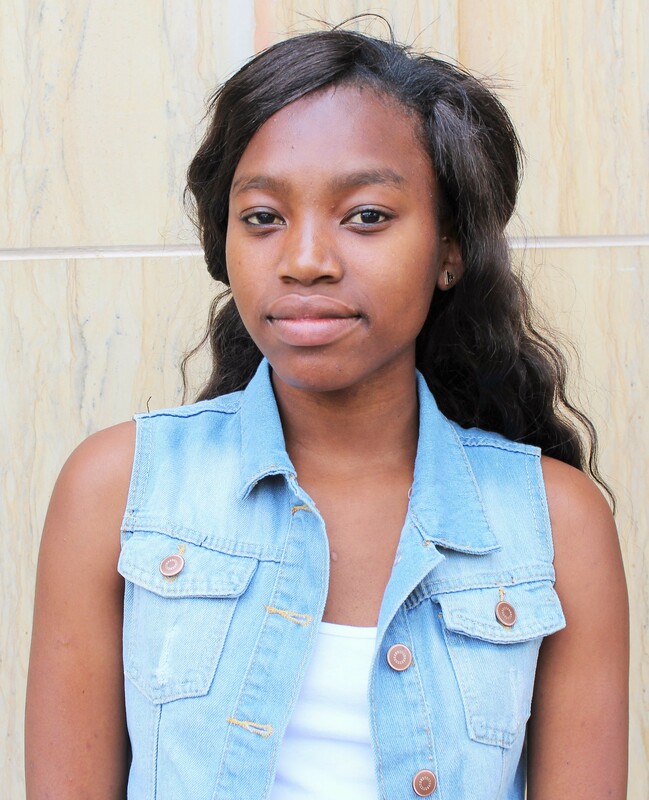 Zenzele is one of two students from South Africa at the university dispatched in 2014 for pursuit of higher education in maritime studies with financial assistance from the institution as well SAMSA. The university finances enrolment, tuition and related fees at the institution while SAMSA assists with travel, living allowances and related costs. A strong wind on his wings! However, his is a true ‘rags to riches’ story for someone born of a single parent in the small rural area of Mangethe, and who shortly after the death of his domestic worker mother while in his teenage years, found himself roaming the streets of Mandini, unable to continue with his schooling due to lack of support. Having eventually passed his matric, Zenzele – the youngest of four children and whose father disappeared on him for years only to die shortly after a reconnection with the family – had to toil then only as a gardener in order to make ends meet. 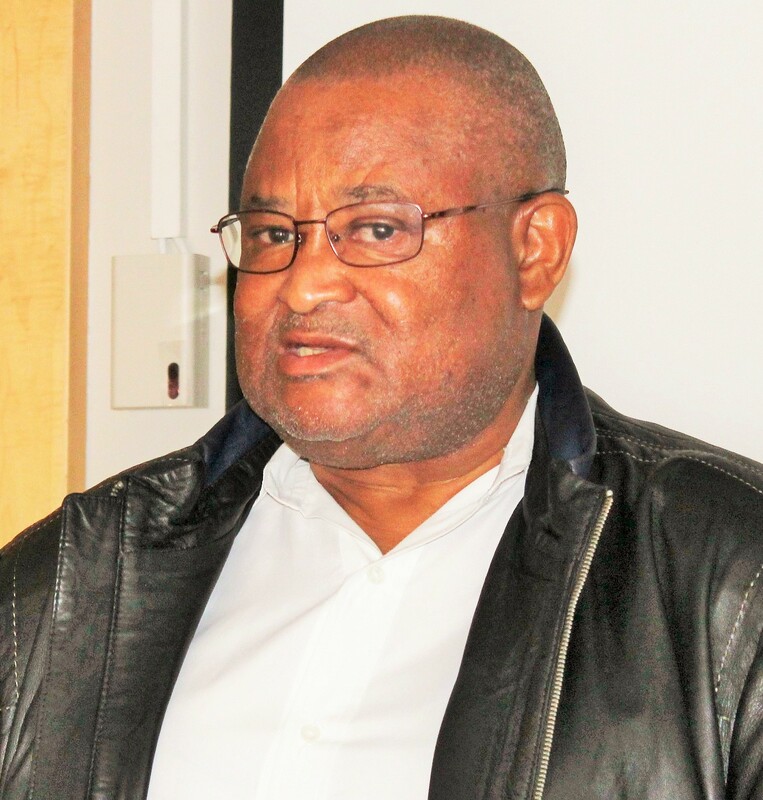 This was until his fortunes turned for the better in 2009 after his employer offered to fund his enrolment and studies of Human Resources Management at the ICESA College in Durban. “That’s where I started to realize that life is full of God’s Grace. Life was really hard and sometimes I stayed at the church tent in town. I survived on hand-outs,” he recalled this week. 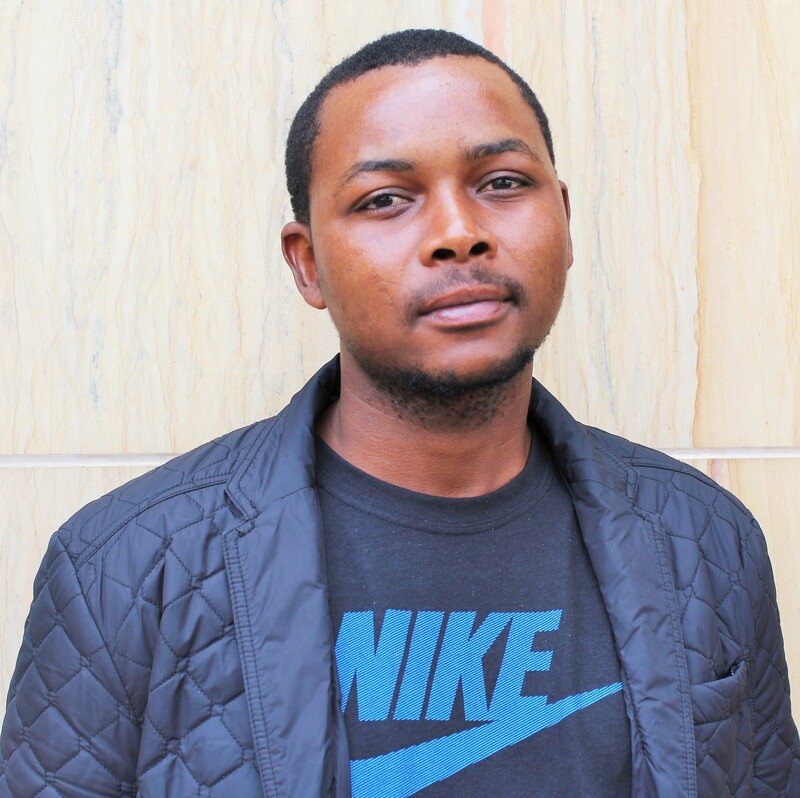 Zenzele grabbed the opportunity with both hands as, as soon as he was back in class at the college, came another opportunity in the form of a bursary from the Jacob Zuma Foundation. The bursary not only funded his first stint at maritime studies at the Durban University of Technology (DUT), but also took care of all his other debts up to that point in time. 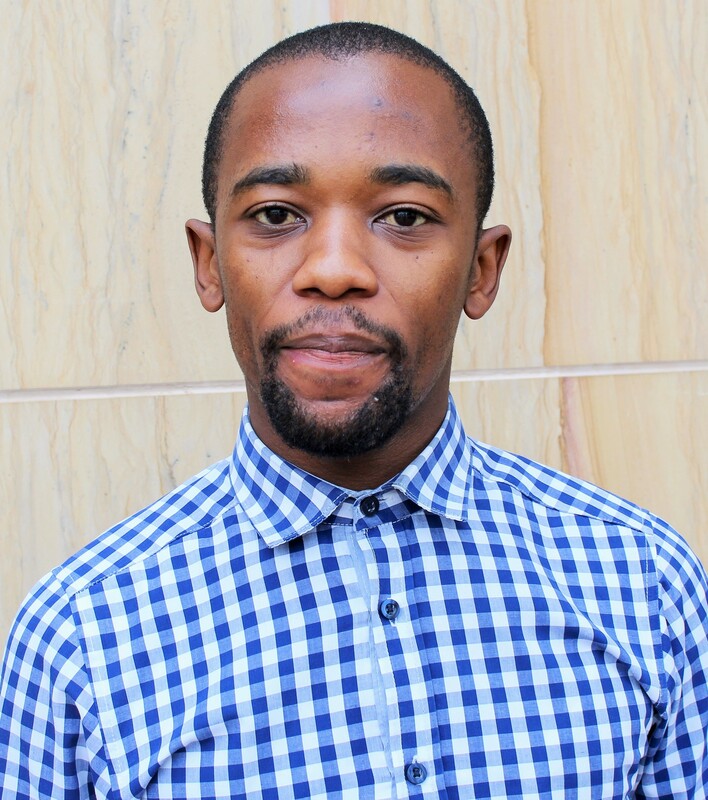 Now set with strong winds in his sails, after successfully completing his studies in maritime at DUT, Zenzele applied for and got accepted in 2014 as one of two South African students at the Vietnam Maritime University ISE enrolled for a four year undergraduate degree scheduled for completion in 2019. His class achievements so far suggests that he has not looked back. Asked this week about the exceptional performance, Zenzele attributed his success with his studies so far to support received from others, but specifically South Africa’s attaché to Vietnam, Mr Vusi Skhosana. In fact, he plans to finish ahead of time! “The scholarship runs until 2019 but we were told we can finish before that if we reach the graduation credits that are required, and that you can quickly reach them if you take more than one course at the same time. I have done that but with difficult courses I prefer to take one at a take for concentration purposes,” he said. Meanwhile, with regards Vietnamese people and culture, Zenzele felt it was difficult partly because in Hanoi, people speak ‘Vietnamese’ which he described simply as a mixture of French and Chinese/Mandarin. “The culture differences are one of the barriers that hinder the progress, but it is manageable if you stick to the purpose. It took me a long time to get used the Vietnamese food. Commenting on Zenzele’s good performance in his maritime studies to date, SAMSA Centre for Maritime Excellence Executive Head, Ms Sindiswa Nhlumayo described it as heartening to note the seriousness current South African students pursuing maritime sector studies at universities abroad were reflecting. “Zenzele’s performance not only reinforces confidence that our faith in them is not misplaced, and that as a country and at SAMSA, as a government institution, we are actually on the right track in campaigning hard to expand education, training and skills development opportunities for our youth in the maritime sector. 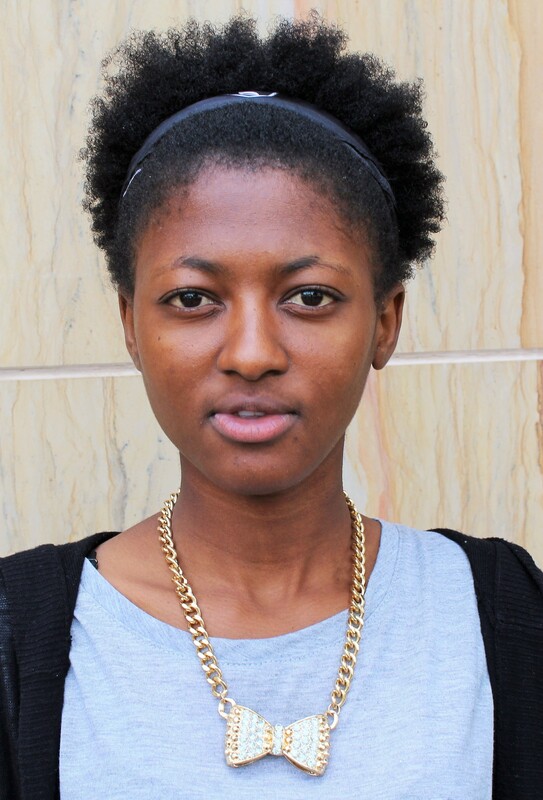 “But this kind of performance by students like Zenzele now also positions them as role models for others wishing and hoping to enter the field. We hope Zenzele maintains the standard for the rest of the course and that he returns home soon with an even higher degree of sharpness!” said Ms Nhlumayo. South Africa currently has six students at the Vietnam Maritime University under the scheme through which the Vietnamese university foots the enrolment and tuition of the youths. The additional four students left for Hanoi in September 2015. Three South Africa youths studying to be marine engineers made history in South Africa’s maritime economy sector here at the weekend when they boarded for their training the country’s first registered cargo ship since the dawn of democracy. MAKING HISTORY: (From Left) Samkelo Ndongeni (25) a deck cadet from Ngqushwa near King Williams Town, Thembani Mazingi (24) an engine cadet from Cofimvaba, and Gordon Sekatang (26), also an engine cadet from Nelspruit in Mpumalanga, with the Cape Orchid skipper, Captain Edgardo De Asis prior to departure Friday with a trade cargo destined for Asian markets. The trio will remain with the ship for at least six months. Similarly, the city of Nelson Mandela Bay also marked its name in the country’s maritime sector’s history books when it was confirmed as the home of the country’s first registered vessel since 1985. The city is already home to the country’s first higher education and research institute, the SA International Maritime Institute (SAIMI) based at the Nelson Mandela Metropolitan University. At the port of Saldanha, Western Cape; the new historical records surfaced at an event on Thursday evening to celebrate the registration of the first cargo vessel under a South African flag. The Cape Orchid, a Vuka Marine cargo vessel that has made history by becoming the first to be registered under the South African flag since 1985. It is the first of two expected to lead in the campaign by the SA government, assisted by SAMSA to have as many trade vessels as possible registered in the country. The vessel named the Cape Orchid is owned by Vuka Marine, a South African joint venture company between Via Maritime Holdings (South Africa) and K-Line and Hong Kong based Japanese firm, K-Line. The three youths – two from Eastern Cape youths, Samkelo Ndongeni (25) a deck cadet from Ngqushwa near King Williams Town, and Thembani Mazingi (24) an engine cadet from Cofimvaba, and a third, Gordon Sekatang (26), also an engine cadet from Nelspruit in Mpumalanga, all trainee seafarers, were taken on board the newly registered vessel at Saldanha Bay for a hands-on ship management practical training scheduled to last six months. 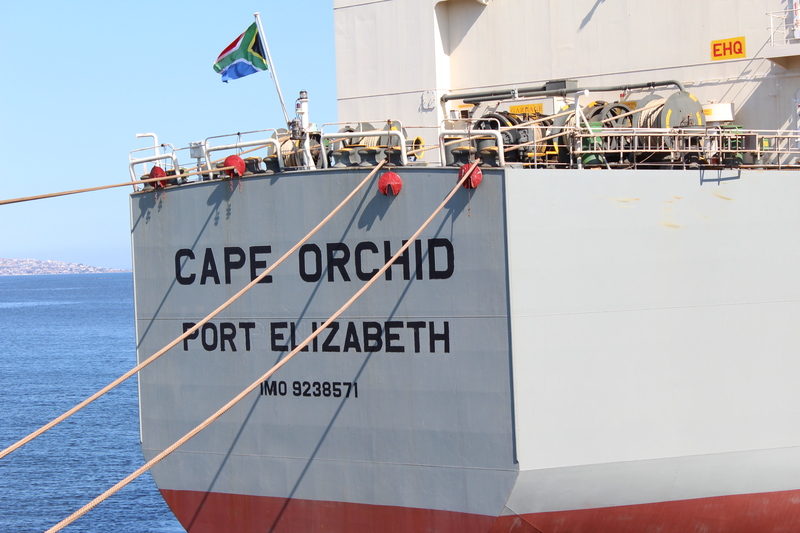 The trio’s first travel aboard the Cape Orchid – a 32 day one way journey, was to China where the 279m long cargo vessel will off-load some 170,000 tonnes of iron ore – also its first trade cargo from South Africa since registration. The registration of the vessel – the first of two expected this month from the same company – under the South African flag, was hailed as highly significant by both Government and the private sector here last night, against the backdrop of the country’s renewed campaign under Operation Phakisa (Oceans Economy) to grow, expand and align the maritime economic sector into the country’s main economy. 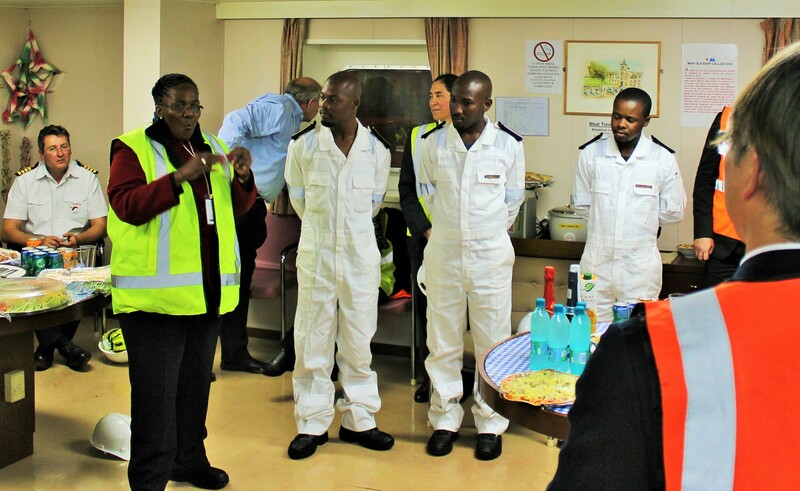 Several officials at the celebration event held onboard the vessel at Saldanha on Thursday evening included Transport Minister Dipuo Peters and her deputy, Sindisiwe Chikunga, senior management from the SA Maritime Safety Authority (SAMSA), Portnet, Vuka Marine, K-Line as well as Anglo American’s Kumba Iron Ore Mining Company. 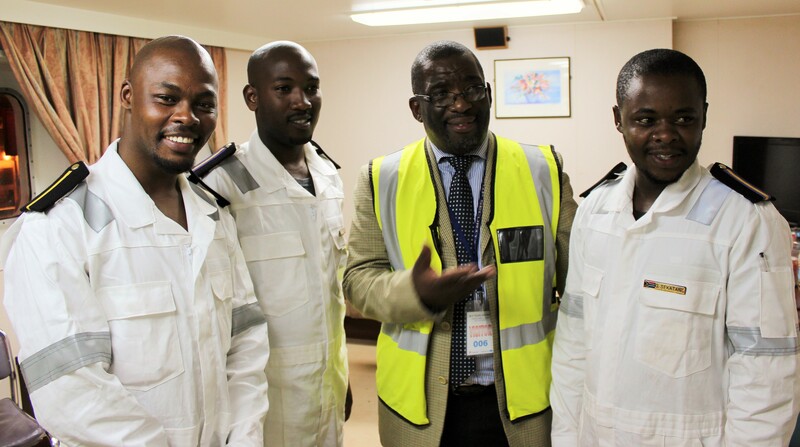 A HELPING HAND: SA Maritime Safety Authority (SAMSA) CEO, Commander Tsietsi Mokhele (with reflective jacket) with the seafarer trainees aboard the Cape Orchid currently on its way to East Asian markets. Vuka Marine CEO, Andrew Millard confirmed that the Cape Orchid is the first merchant vessel to have been added onto the South African register since 1985 and the first to be registered under the Ship Registration Act of 1998. According to Mr Millard, apart from being the first vessels to be registered under the SA flag, these would also be the first non-Government, South African flagged ships to take South African cadets on board in over a decade. Seafarer training at state level, facilitated and pursued hard by among others; the SA Maritime Safety Authority since 2011, is among initiations currently underway to unlock the country’s maritime economic sector through broadening participation by all South Africans. The drive for broader education, training and skills development on the country’s maritime economy comes against a backdrop where South Africa, despite having access to more than 3000km of a coastline from the Atlantic, the Southern Ocean through to the Indian Ocean, and with relatively highly developed ports through which close on 90 per cent of the country’s trade sails through, there is little if any meaningful involvement of the rest of the country population. On the ocean transport side, as at 2013, South Africa had less than 2000 seafarers or less than one percent of the seafarer jobs globally due to skills shortage. However, with the launch of the Operation Phakisa (Oceans Economy) initiative a year ago, the Maritime Transport and Manufacturing lab aimed to create approximately 15 000 jobs, with an additional 39 000 to 46 000 through the multiplier effect by 2019. The implication was that this would require partly the training of between 17 500 and 28 500 seafarers during the five year period from the 240 officers per annum currently being produced. To date, the sea training of seafarers has been aided in no small by the SA Maritime Safety Authority through its dedicated training cargo vessel, the SA Agulhas that it acquired from the Department of Environmental Affairs in 2012. According to SAMSA, the intervention which sees as many as 90 cadets placed on the vessel at any one time, has benefited about 600 graduates who between them have gained collectively about 6921 months of sea time that they otherwise would not have had. 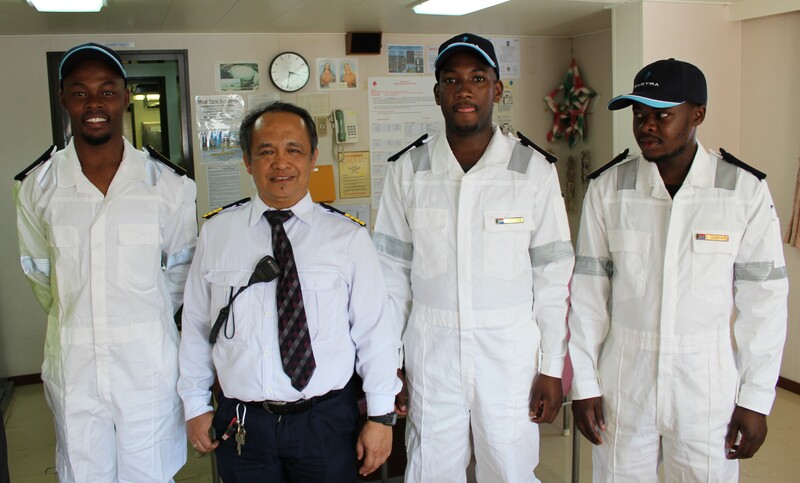 Ndongeni, Mazingi and Sekatang, under the tutelage of Captain Edgardo De Asis have now formerly joined the steadily increasing corps of cadets the country hopes to turn into highly skilled seafarers in significant numbers over the next five years. Ndongeni, who currently resides in Khayelitsha and a student member of the SA Society of Master Mariners, joined the vessel having recently joined SA Maritime Training Academy (SAMTRA) as deck cadet. After his maritime studies, he joined offshore supplier vessels as a deck hand and did a tour of duty on the Greenpeace vessel, Rainbow Warrior as a volunteer deck cadet for four months earlier this year. He is hoping to be a cargo vessel captain in seven years’ time. His fellow East Capean, Mazingi and the third student, Sekatang; both started their careers also as trainees on the SAMSA’s Marine Engineering Knowledge Conversion Programme in 2013. 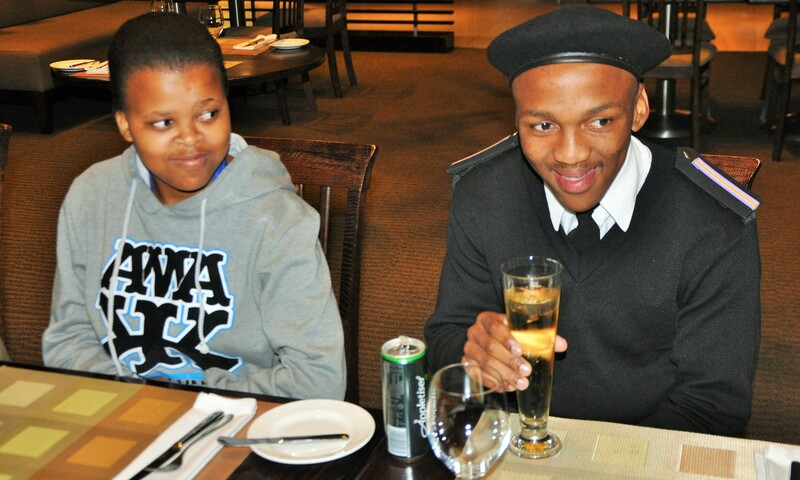 After completing their workshop training at Durnacol, they both joined the SA Agulhas project in June 2014 as engine cadets. They are now currently on board the Cape Orchid, headed for China. Mazingi’s aim ultimately is to be a marine engineer, while Sekatang seeks to be chief engineer – a study and training process that may take up to 10 years. Asked to comment both about the opportunity they have received and its historical significance, the trio said they were thrilled. They thanked the South African government in particular for the facilitation that led to the opportunity, and undertook to do their best to ensure they utilize it to the fullest. “I hope to be able to use this training opportunity to achieve my dreams of being a vessel’s captain one day soon, and hopefully in the process, also serve as a role model to encourage more other youths to consider a career in the maritime economic sector,” said Ndongeni. Four South African youths pursuing maritime sector academic studies will jet off to Vietnam today where they will be enrolled at the Vietnam Maritime University for the duration of their studies. 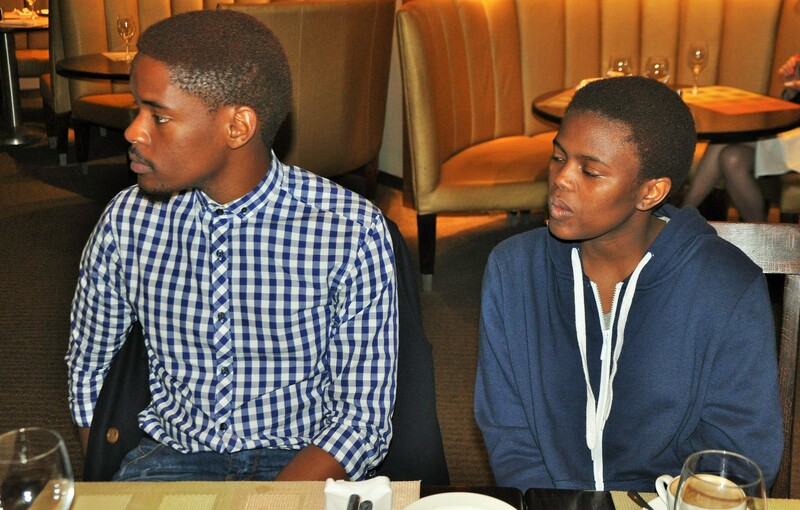 Mandisa Mthembu (18), Kentse Matshira (21), Mpumelelo Ndebele (27), and Mthunzi Makupula (20); all candidates for undergraduate maritime studies, leave for Hanoi today (Wednesday, 16 September 2015) in terms of a recent groundbreaking deal for South Africa that will see the students receive their maritime education at the Hanoi based university with financial support largely from the Vietnamese government. They will be the second group to join the university from South Africa. The four were selected for the opportunity earlier in the year following to a grant offer from Transport Department of the Socialist Republic of Vietnam to South Africa for the placement of maritime economy students at the prestigious Vietnam Maritime University. Vietnam Maritime University is a long established institution dating back to 1956. It is one of 17 key universities of Vietnam as well as the largest school in the Vietnamese transportation sector. Its focus is primarily on all subjects related to the maritime economy of Vietnam. Vietnam Maritime University currently has more than 17,000 students engaged in various study courses provided in 35 undergraduate subjects or specializations, 11 postgraduate subjects of masters degree, and eight research specializations, of which there are two subjects; “Maritime Economics and Globalization” and “International Business & Logistics”, conducted in English by professors and specialists drawn from countries including the United States of America, Europe, Japan and Vietnam. SA Maritime Safety Authority management and relatives of the four SA students headed for Vietnam in 2015 during a send off function in Pretoria on Tuesday, September 15, 2015. Vietnam Maritime University rector, Associate Professor Dr. Luong Cong Nho described the education grant offer to South African students as a contribution towards building and tightening good relations between the Vietnam people and South Africa. In terms of the deal, Vietnam Maritime University will grant scholarships worth approximately US$23 000 per student per whole course of study beginning in the academic year 2015 -2016. However, the scholarship only covers all the tuition fees and university‘s hostel accommodation (if required), but excludes subsistence allowances and return international airfares. The SA Maritime Safety Authority (SAMSA) – a government institution currently at the forefront of facilitating among other issues, the expansion of education, training and skills development for South Africa’s maritime economic sector – stepped in to cover the extra costs excluded in the grant for three of the four students. 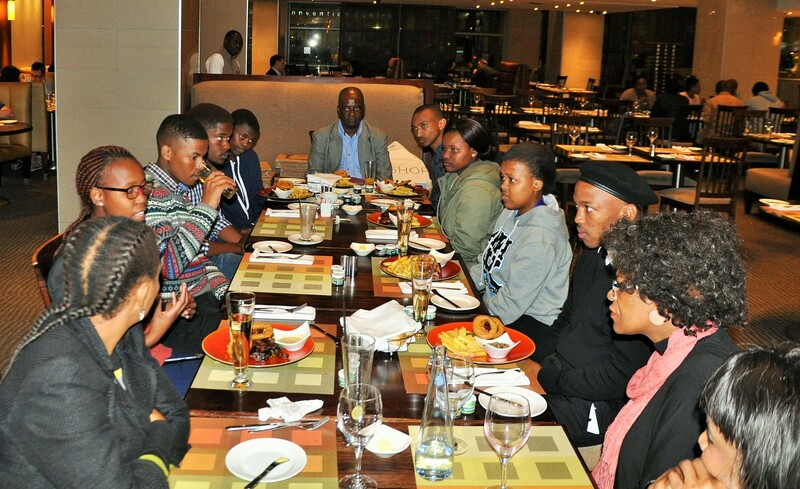 On Tuesday, at a send-off function held at the SAMSA offices in Pretoria, attended by a few current and former national government officials as well as relatives of the four students, former South Africa’s ambassador to the United States, Welile Ntlapho urged the group to make the best of the opportunity presented them by the Vietnamese government. Mr Ntlapho, 67; outlined the importance of South Africa’s maritime economic sector and the challenges it currently faces, especially with regards lack of skills, and urged the youth to “not dare fail!” (To listen to Mr Nhlapho’s brief speech click here..)On Tuesday, at a send-off function held at the SAMSA offices in Pretoria, attended by a few current and former national government officials as well as relatives of the four students, former South Africa’s ambassador to the United States, Welile Ntlapho urged the group to make the best of the opportunity presented them by the Vietnamese government. ‘When you get to Vietnam and begin with your studies, you must learn, learn, learn. You dare not fail, for if you do, we will call you ‘sellouts’,” said Mr Ntlapho jocularly, to the audience’s applause. Department of International Relations and Cooperation (DIRCO) director for South East Asia, Ms Debora. M. Balatseng said the South African government was encouraged to see more youth taking an interest in maritime economy studies – a field previously ignored by the majority of the country’s citizens. ‘It is good that this current government has plans in place and a vision that South Africa emerges as one of the big economies also reliant on the maritime economy. It is important that as a country we prepare our young ones to take over this task that our government has identified,” she said. Commenting on behalf of SAMSA CEO Commander Tsietsi Mokhele, Mr Boetse RamatlhoAccording to Ms Balatseng, increasingly opportunities are emerging for SA youth to obtain education, training and skills across a whole range of maritime economy activities not limited only to higher education, and added that were several countries across the world, including the Phillipines, that were keen to share their knowledge, experience and resources with South Africa. He added that SAMSA welcomed the opportunity to also support the students headed for Vietnam with the hope and belief that their exposure to the Far East Asian country’s higher education as well as general country maritime operations will fully enable them to meaningfully contribute to South Africa’s economic development on their return in a few years’ time. Maritime economic sector education, training and skills development is set to expand from student orientation to include actual teacher training, and engaged yet again in the endeavor is Simonstown-based Lawhill Maritime Centre, the country’s only formal high school that’s been offering maritime economy sector education subjects, such as nautical sciences and maritime economy among others. 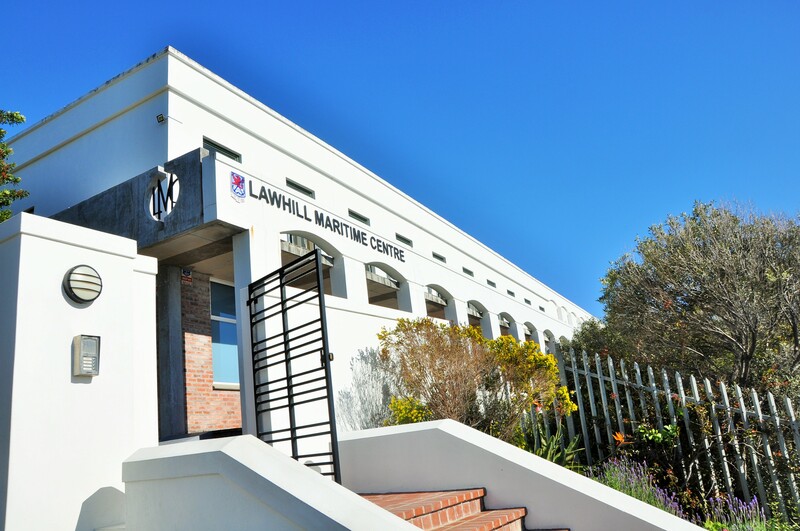 STANDING UP: Just above the Simonstown harbour stands the Lawhill Maritime Centre, originally a foundational level education centre specializing in maritime economy sector subjects, and now poised to possibly offer specialized in-service training also to teachers. The centre is currently engaged in discussions with the SA Maritime Safety Authority (SAMSA)’s Centre for Maritime Excellence – a unit that’s been devoting much time and effort to facilitating country wide education, training and skills development for South Africa’s maritime economic sector. At a meeting recently in Simonstown between Lawhill Maritime Centre head Mr. Brian Ingpen and SAMSA Centre for Maritime Excellence executive head, Sindiswa Nhlumayo, it was disclosed that there was a growing need for escalation of maritime economy education, training and skills development to already qualified teachers in order to meet the expansion of the sector education from founding levels through to universities and technical and vocational education institutions. According to Mr. Ingpen, several provinces including the Western Cape, the Eastern Cape KwaZulu-Natal had already indicated a keen interest and desire to have teachers undergo in-service training in maritime economy school subjects in order to meet the demand for introduction and expansion of the sector education at schools. It also actually emerged that two new dedicated maritime education schools were planned for the Eastern Cape for as early as 2016, with officials of the provincial government in formal engagement with Lawhill for assistance and guidance in the endeavor. SAMSA’s Centre for Maritime Excellence has over the past few years been engaged with several other provinces such as Gauteng and Limpopo some of which are keen to covert a set of identified existing schools into dedicated maritime sector education centres. In addition, close to a dozen further education and training colleges countrywide are in the process of being roped into the maritime sector education, training and skills development campaign. Mr Ingben said the development underscored the importance and urgency of the need for development of a new corps of teachers trained for and skilled in maritime education subjects. With the latest endeavor, it was suggested during the meeting that Lawhill, also now in touch and consultation with the new Port Elizabeth-based SA International Maritime Institute (SAIMI), could become the dedicated centre for excellence in teacher in-service training. 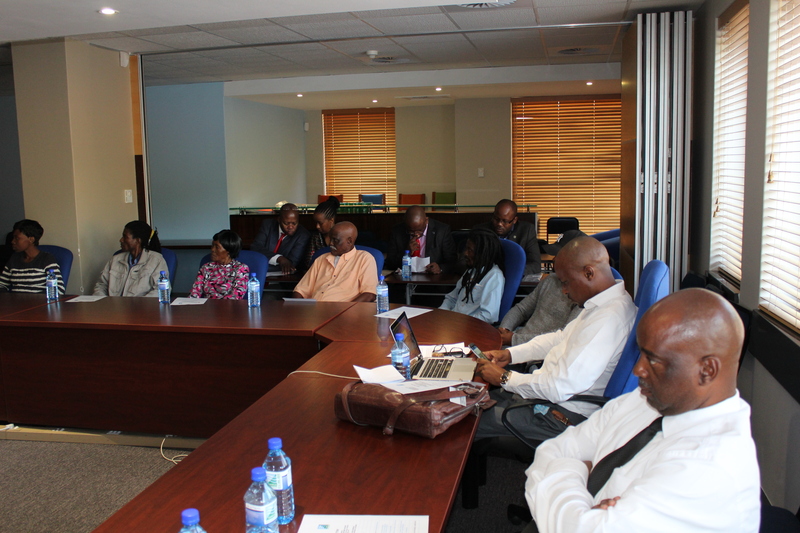 SAMSA’s Centre for Maritime has committed to assisting in facilitating achievement of the goal. South Africa’s renewed drive to formally incorporate the country’s marine economic sector into the mainstream economy is gaining steady yet significant momentum, with education and training at both school and tertiary levels, inclusive of technical and vocational education and training; leading the initiative. EDUCATING SAILORS: SAMSA Centre for Maritime Excellence executive head Ms Sindiswa Nhlumayo (third from Right), and (From Left) SAMSA skills development manager John Phiri; Centre for Maritime Excellence executive PA, Charity Bodiba and SAMSA human resources executive manager Ms Lesego Mashishi with Lawhill Maritime Centre students sponsored by SAMSA during a visit in August 2015. SAMSA is to increase the number of youths at high school for the 2016 school year. This education and training effort now on its fourth year, and driven hard by the SA Maritime Safety Authority (SAMSA) through its Centre for Maritime Excellence headed by Ms Sindiswa Nhlumayo, will be marked yet again in September 2015 by an awarding of more bursaries to a carefully selected group of young aspirant mariners currently in their junior high school level. The new intake of the young pupils whose selection will be completed in a few months after all applications have been considered, will all be placed at the Simon’s Town school’s Lawhill Maritime Centre – one of a growing number of maritime education and training institutions that SAMSA has established a functional joint partnership with in pursuit of the national marine economy education and training endeavor. 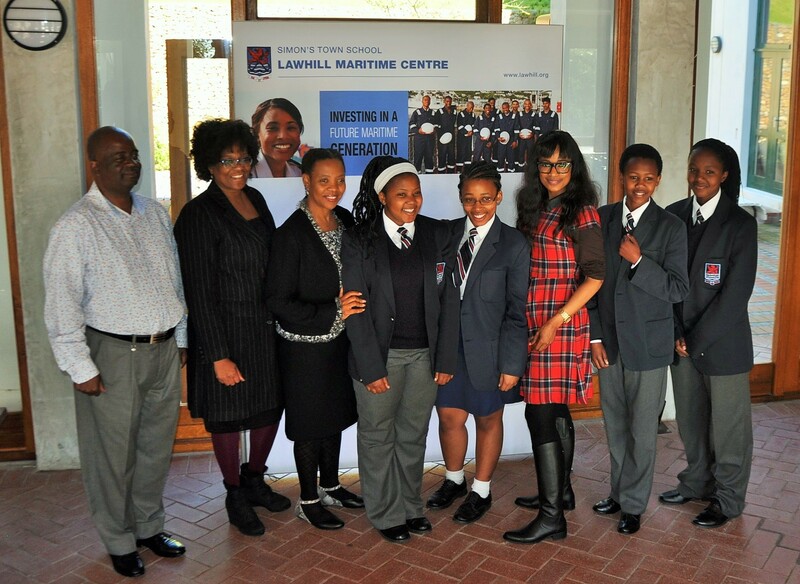 The new set of bursaries for Lawhill Maritime Centre are to be awarded to learners who will be in Grade 10 in 2016. Once approved for and awarded the bursaries, the subject choice that will be followed by successful candidates is two languages chosen from English, Afrikaans and Xhosa, Mathematics, Physical Science, Maritime Economics and Nautical Sciences. Be physically fit – candidates should be aware that ailments such as diabetes, epilepsy and inferior eyesight (including colour blindness) will discount them from following a sea-going career. Prospective deck officers need to pass the special SAMSA eyesight test. 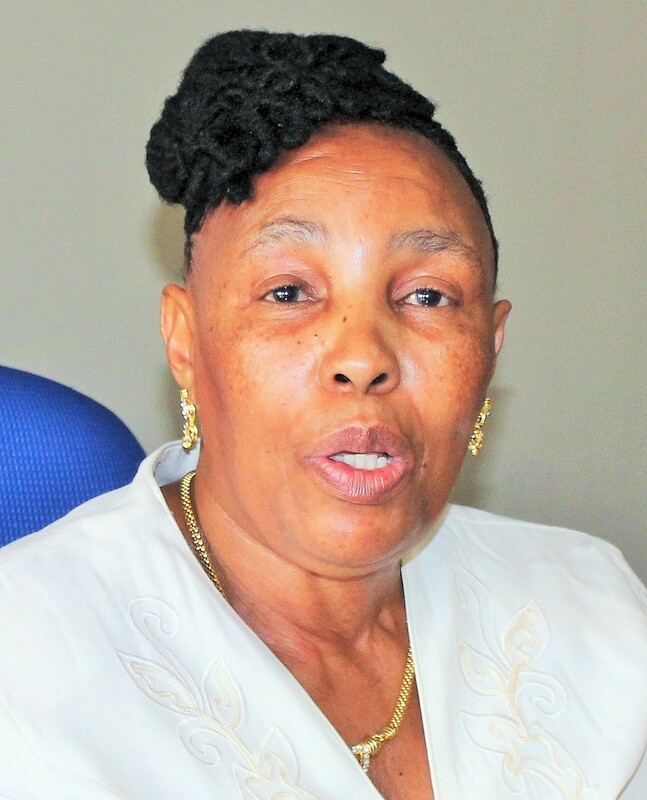 Currently Lawhill Maritime Centre, with an average annual enrolment of some 130 pupils a year, has to date had 18 SAMSA sponsored pupils enrolled for maritime high school level, with the number due to increase to 24 after the 2015 intake. 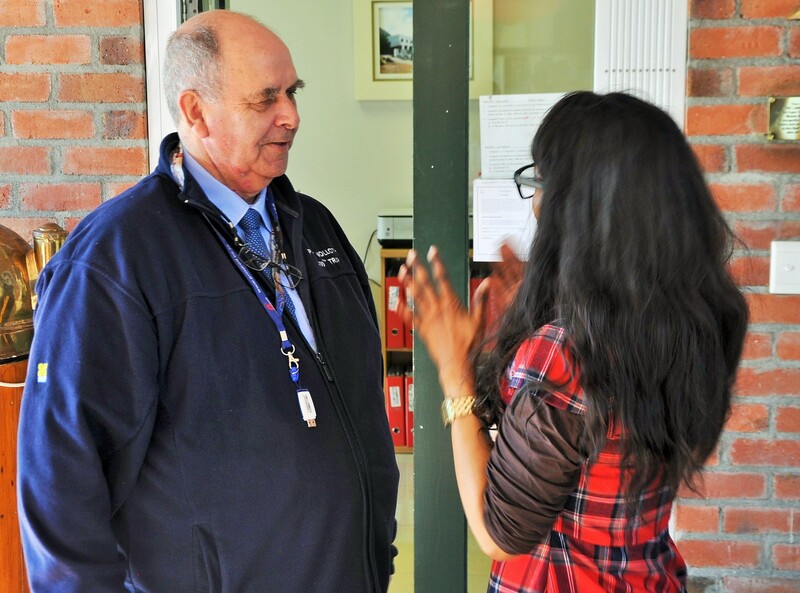 Led by Brian Ingpen, the Simon’s Town based multiple award-winning maritime education centre has been operational for close on two decades, having received its formal national accreditation in 1997 following its launch a year earlier. It offers two industry and State approved maritime economy study streams at high school level from Grade 10 to 12; a maritime economics stream encompassing a basket of subjects that include maritime geography, port studies, voyage costing, chartering, cargo handling, ship management, agency operations, maritime law and few others. The second stream involves nautical science, encompassing subjects that include coastal and astro-navigation, naval architecture, seamanship, cargo stowage, stability, meteorology, etc. Pupils at the school come from all over South Africa, but notably Gauteng, Eastern and Western Cape provinces, KwaZulu-Natal as well as African countries including Namibia and Mozambique. The bursary covers fully tuition fees, accommodation costs for bursars living in residence (inclusive of meals provided in residence), cost of books according to stipulations by the training institution, access to computer (purchase a laptop), and transportation including four free train or bus tickets to visit family in official academic holidays. SAMSA through its Centre for Maritime Excellence, and with ongoing continuous support from various key stakeholders including government departments, drives a comprehensive educational and training campaign encompassing various skills development aspects of the country’s maritime economic sector at all levels; inclusive of high school, tertiary and technical and vocational education and training. SAMSA in 2012 also gained possession of a sea-going training vessel, the SA Agulhas, for use in the maritime skills development drive. The organization also remains the driving force behind current efforts to establish South Africa’s first dedicated maritime institute. Staying constantly in touch with SA Maritime Safety Authority (SAMSA) financially sponsored students at the country’s various education institutions is among key priorities for Ms Sindiswa Nhlumayo, the executive head of the organization’s Centre for Maritime Excellence and to which SAMSA’s maritime economic sector education, training and skills development program is entrusted. 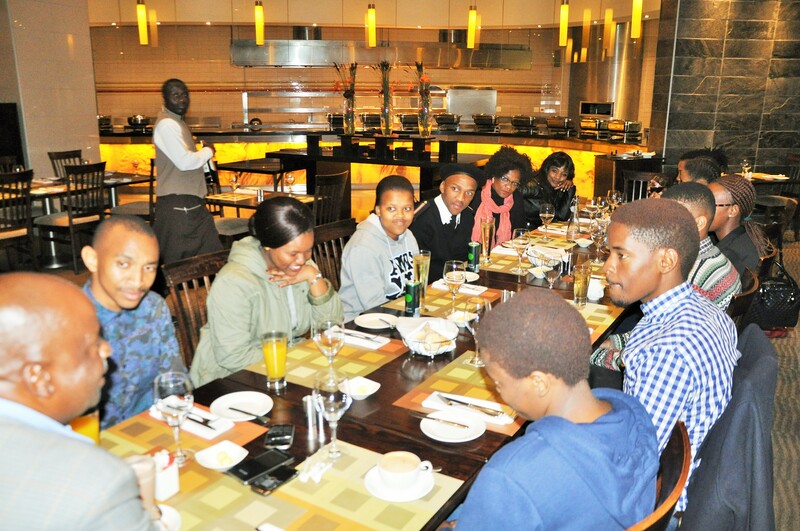 And so early on a Thursday evening in August 2015 it was the turn of the group of SAMSA sponsored students at the Cape Peninsula University of Technology (CPUT) to receive her visit, and during which they were hosted to a sumptuous dinner at one of Cape Town’s upmarket hotels, the Westin. 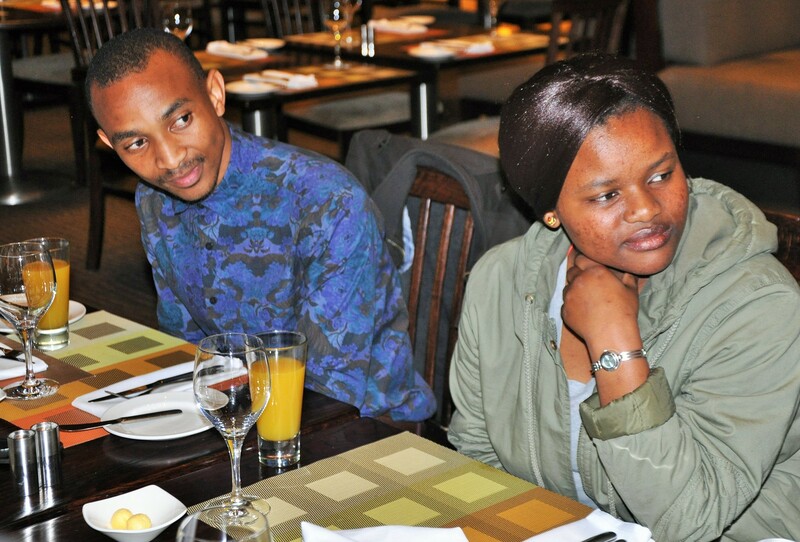 SHARING EXPERIENCES: The SAMSA sponsored CPUT students taking the opportunity to share their views and experiences at CPUT with SAMSA’s CEM management during dinner. The visit comprised not only the desired group meeting and one-on-one chats with Ms Nhlumayo and her team of managers including John Phiri (senior skills development), Sicelo Fayo (content manager), Charity Bodiba (executive assistant) and new Human Resources executive head, Lesego Mashishi; but it also encompassed formal delivery of computer equipment to the students for their use during their studies. The lap tops are part of their financial support by SAMSA. SAMSA spends an average R50 000 per annum per student, and all of whom are resident at the various tertiary level institutions, mainly in the Western Cape and KwaZulu Natal currently. 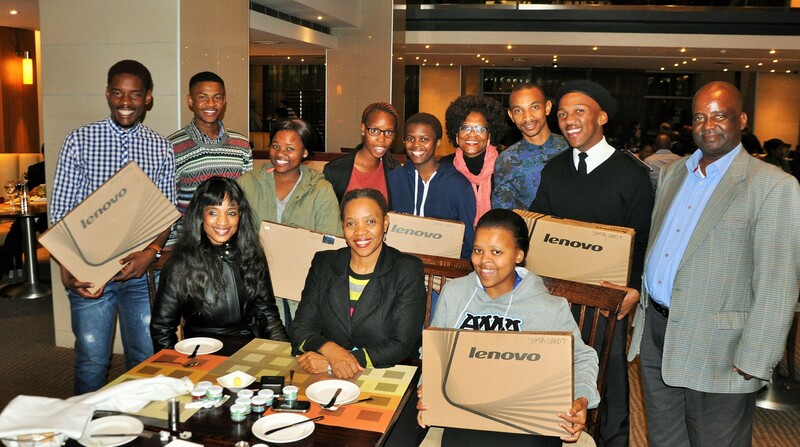 The eight CPUT students met and presented with lap tops on Thursday evening included Sesona Matiso, Thando Jobela, Sanelisekile Twala, Bulelwa Maseti, Vuyisani Mvakwendlu, Zamanuba Pandle, Nosisikelelo Maseti and Sabelo Hadebe. SENSING WISDOM: The CPUT SAMSA sponsored student listen carefully to Mr. John Phiri, senior skills development manager, as he shares with them some pearls of wisdom the youth would need on their way to success both at school and work. Chatting to the group, Ms Nhlumayo said meetings of the nature at regular intervals were important for SAMSA and the students in order to share information on a variety of relevant issues concerning the organization and students but also challenges faced by the students during their stay and study at the educational institutions. Ms Nhlumayo described the CPUT and related institution’s current student cohort in 2015 as particularly important for SAMSA’s maritime economic sector education, training and skills development program as it was a pioneering group in terms of the program. “You are the lead group in this program and therefore pioneers in this endeavor to develop skills for the country’s maritime economic sector. “Your achievement of a high rate of success is important for the program as it will also guarantee continued financial support of more students, many of which will come after you. Therefore, bear it in mind that you carry a responsibility not only to succeed in your studies at CPUT but that you do so in a most exemplary way that will be an inspiration also to others with interest in maritime economy studies,” Ms Nhlumayo urged the group. Mr Phiri also encouraged the students to: “Humble yourselves and learn all you are taught in your respective fields of study at the university. Remember, yours are scarce skills in which you have to succeed. After further words of encouragement also from Ms Mashishi, the students in turn expressed appreciation for the opportunity to meet and interact with SAMSA CME management, describing the event as most welcome and necessary.